At the 2015 IPCPR Trade Show, Felipe Gregorio Cigars showcased a new iteration of its Art of Power line. Felipe Gregorio Cigars is owned and operated by Philip Wynne. The company has been around since 1990 and this year is celebrating 25 years in business. The Art of Power is an extension of the Felipe Gregorio Power line – which was introduced ten years ago as the company was celebrating 15 years in the cigar business. The original Art of Power introduced four unique artesian-style figurado vitolas. For 2015, the company has re-blended the Art of Power in three more traditional (parejo) vitolas. Recently I have had an opportunity to smoke the 2015 Edition of the Art of Power in the Lord Byron (Toro) format. This cigar was nothing short of a grand slam home run and is one of the standout releases I have had in 2015. Throughout its 25 years in the industry, Felipe Gregorio has produced cigars in the Dominican Republic, Nicaragua, and most recently Costa Rica. In 2014, the company took things in another direction releasing two Costa Rican puros made in Costa Rica. For 2015, the company heads back to its Dominican roots as it produced both Art of Power 2015 and the Felipe Gregorio Pure Dominican out of the Dominican Republic. Without further ado, let’s break down the Felipe Gregorio Art of Power Lord Byron 2015 edition and see what this cigar brings to the table. The Art of Power 2015 features tobaccos aged seven years in cedar trunks. The Art of Power 2015 comes in three parejo-shaped vitolas. The Habana Ecuador wrapper of the Felipe Gregorio Art of Power Lord Byron 2015 Edition has a roasted coffee bean color. Upon closer examination, there is a nice amount of dark marbling on the wrapper. The wrapper also has an oily complexion. There are some visible veins and some very thin visible wrapper seams. Overall I would consider this to be a smooth surface on the wrapper. The band of the Felipe Gregorio Art of Power red-colored crown and a red colored shield resting on a white oval background. Both the crown and shield contain gold adornments. In between the crown and shield is the text “POWER” in large black font. Toward the bottom of the shield is a black “XV”. There is a gold medallion on both the lower left and lower right side of the red shield. Surrounding the white oval background is gold trim. At the top of the band is the text “15th Anniversary” in gold font on a black background. On the lower portion of the band is the text “PUROS FINOS” in large gold font – also on a black background. The left side of the band text “Felipe” and on the right side is the text “Gregorio” – both in white font. Below the text on each side is the text “POWER” in gold font. The lower portion of the band has a red background with the text “LIMITED” and “EDITION” in gold and black to the left and right respectively. As I normally do, I opted to go with a straight cut to start the cigar experience. Once the cap was removed, I moved on to the pre-light draw phase. When word first came out about the Art of Power 2015 Edition, one thing that was mentioned about the flavor profile was a “salted caramel” taste. I can’t say whether or not this was the power of suggestion, but the pre-light draw definitely delivered that flavor. I also detected a mix of cocoa notes with the salted caramel. While these notes might sound like dessert, this very much had a tobacco taste to them making these notes very enjoyable. Overall I still considered this an outstanding pre-light draw. At this point I was ready to light up the Art of Power Lord Byron 2015 Edition and see what this cigar would bring to the table. Once I started puffing on the Art of Power Lord Byron 2015 Edition, the notes of salted caramel continued. Now I was confident this was a flavor being delivered. I also detected notes of dark chocolate, earth and a mix of spices consisting of white pepper and cedar. The dark chocolate notes and caramel moved to the forefront while the earth and spices were secondary notes. Like the pre-light draw, the dark chocolate and caramel very much had a tobacco taste to them. Meanwhile the pepper notes were prominent on the retro-hale. During the second third, the earth notes joined the dark chocolate in the forefront. At the same time, the salted caramel notes joined spices in the background. During this stage I also detected some nut flavors in the background. By the last third, the spices moved toward the forefront and joined the earth and dark chocolate notes. The caramel and nut notes were now much more distant. There was a little more in the way of spice toward the end, but there still was enough going on to keep this cigar interesting. This is the way the Art of Power Lord Byron 2015 Edition came to a close. The resulting nub was firm to the touch and cool in temperature. Overall the Felipe Gregorio Art of Power Lord Byron 2015 Edition performed quite well on its burn. It wasn’t a perfect burn, but it still was an excellent one. The burn took a straight path from start to finish. There was a slight amount of jaggedness from time to time, but this was easily remedied with a touch-up. The resulting ash was a silvery gray color with some darker spots. The ash was relatively firm, but there was a little bit of flaking from time to time. The burn rate and burn temperature were ideal. The draw performed quite well. It had a touch of resistance – which is something that I like. 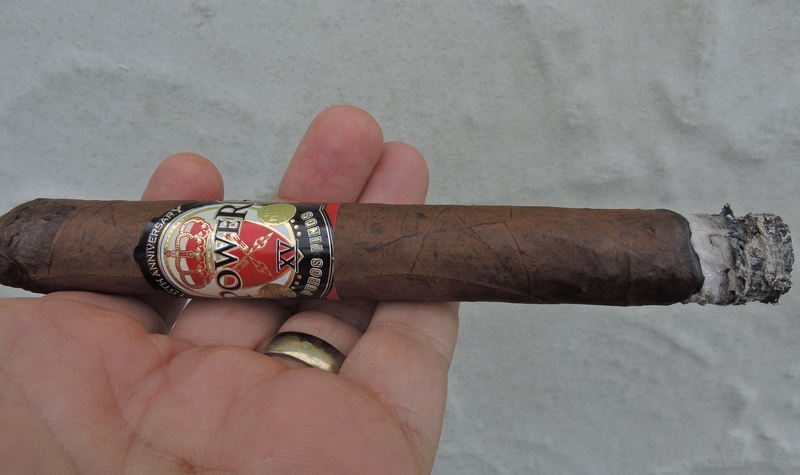 Overall, the Art of Power Lord Byron 2015 Edition was an enjoyable cigar to puff on. In terms of strength and body, I found the Art of Power Lord Byron 2015 Edition to pretty much fall on the upper end of medium for both attributes. By the last third, I found both attributes had progressed to medium to full. During the smoking experience I found both the strength and body balanced each other nicely with neither attribute having an edge over the other. 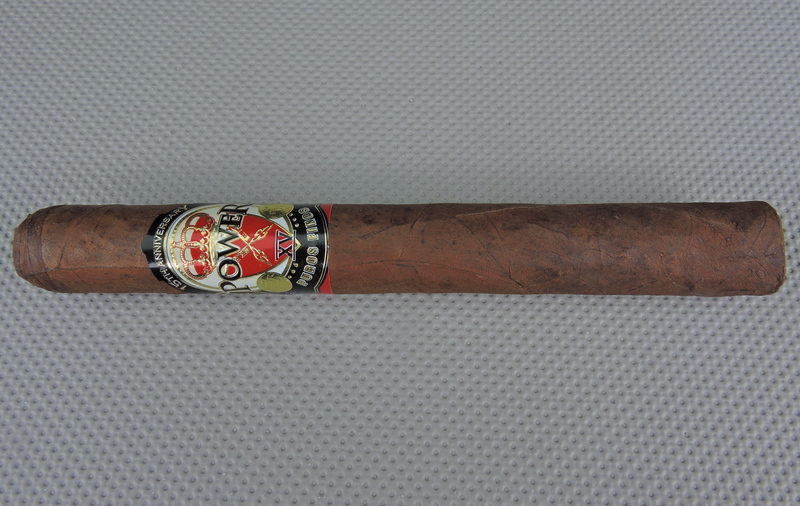 If there is a cigar that is the frontrunner for “Best Under the Radar” cigar of 2015, it is the Felipe Gregorio Art of Power Lord Byron 2015 Edition. Everything just seemed to come together with this particular cigar. When you look at flavor as the most important component in scoring a cigar, this one gets some very high marks. Overall this is a cigar I could recommend to an experienced cigar enthusiast, but I also feel the novice would appreciate it. As for myself, this is a cigar I would absolutely smoke again. It certainly is a cigar worthy of not only a box purchase, but one worth fighting Chuck Norris for. Are these for sale yet? I can’t seem to find any online. SmallBatchCigar.com has some of them.